I need your help. Yes you, sitting in front of the computer browsing through some blogs. Could you please tell me why it took almost 28 years before I discovered the joys of proper homemade quiche? I've had quiche before. If you can call it that. The quiches I've grown used to have always been rather omelet-like and dry. Not a winner. So I went through life thinking that I just wasn't a quiche fan. Sure I would eat it if it was offered to me, but really enjoy it? Or even make it myself? Eh, I wasn't feeling it. But. That all changed on the 21st of March 2010. For suddenly I was faced with not one, not two, but four (yes you read that right) different quiches. The event: The first (and hopefully annual) SA Foodbloggers Conference. The meal: A jampacked buffet including four delicious quiches brimming with flavours from butternut to spinach and feta to cherry tomatoes. But one quiche stood out from the rest. One quiche changed everything. The caramelised pear and Camembert (or was it Brie? I can never tell the difference) one. It was soft and luscious and the flavour combination was simply outstanding. This was what quiche was supposed to taste like. And why tamper with a masterpiece? Here, then, my rendition of the Quiche That Trumped All Other Quiches. 2. Heat oil and butter in a large frying pan. Add the onions, vinegar and a pinch of salt, cover and allow to caramelise. This usually takes about 30 minutes. 3. Meanwhile, place the pears in a separate saucepan with a little bit of water and cook, covered over low heat until soft. 4. Grease a round pastry tin, then line with a greased piece of wax paper, trimming the edges as needed. Press the dough into the pastry tin, covering the sides as well and removing extra dough where necessary. 6. Whisk together eggs and cream, then add thyme and the remainder of the salt. Pour into pastry shell and bake for 40 minutes. Note: If you prefer a slightly more oozy quiche, use 1 less egg and an extra 1/2 cup cream. Pear. And Camembert. In a quiche. How did I not know of this sooner??? Thank you... oh thank you! Glad to be of assistance Robyn! But we really need to thank the wonderful Jenny for dreaming this up. Hey, I was also at SAFBC, how does your version compare to the quiche served? 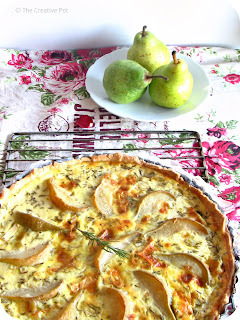 I also instantly fell in love with Jenny's Pear and Camembert quiche! A good quiche can be absolutely amazing! I really love quiches that veer outside of the norm. This is SO one of them. Looks beautiful. Thanks for all the lovely comments guys! Jessica - this quiche is firmer than the one Jenny served. I suspect her ratio of cream vs eggs was a bit different (more cream, less egg). Flavourwise it's pretty similar though. Hi Marisa. I'm going through a bit of a pear phase, and this looks fabulous. Will definitely remember this one. Marisa this is a work of art. Not only is the flavor combination divine, but your images rock. You are well on your way my friend! What a perfect combination. Love them both, although never really put them together into my baking. Sounds wonderful and delicious. I love quiche very much! You know, aside from the fact it was a known breakfast dish, you can still have them even for lunch and dinner. 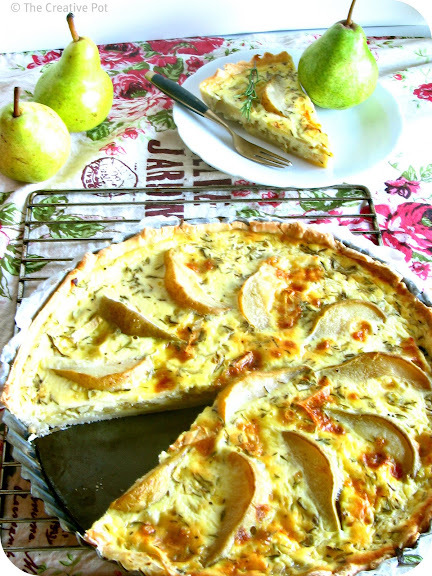 And this is a unique quiche recipe I say, pears and cheese! hmmm Thank you for sharing your recipe! 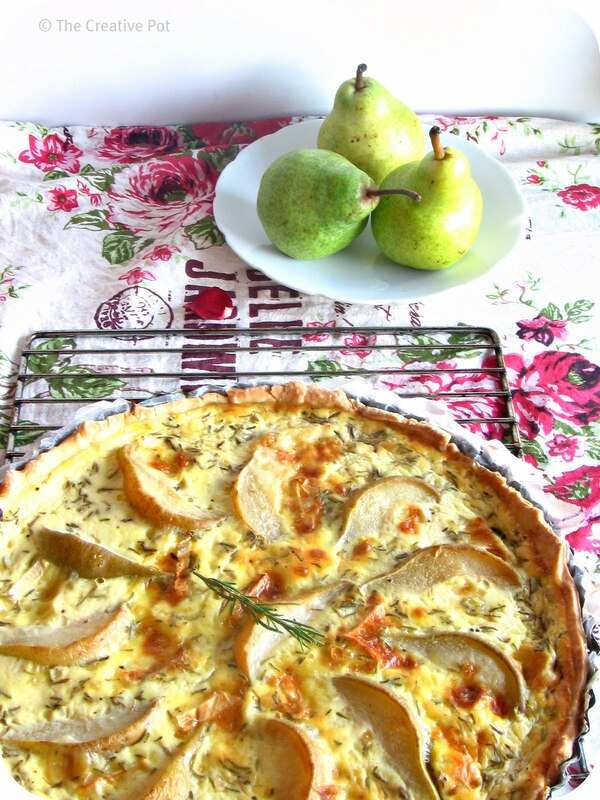 I really like the sound of a sweet and savoury quiche like this! Jislaaaaaik!!! Dis 'n mooi foto!!!!!!! Oh, a homemade quiche is a thing of real, trembly, eggy beauty, and SO easy!! You are right, the quiches at the SAFBC were particuarly divine - love these flavours!